During a three-year expat stint living in Singapore, I had a lot of mealtimes to spend investigating the local food scene. The country’s gastronomic offering is as diverse in flavour as it is in price. However, if you want to experience the culture and save a bundle, stick to the local dishes served at hawker centres throughout the Little Red Dot. Here I reveal my top three Singaporean foods that will tantalise your taste buds while being gentle on your wallet. Singapore is only 719km2 (277m2), it is the 19th smallest country in the world and the second most densely populated after Monaco. This puts severe limitations on land for agriculture and manufacturing, and therefore most food is imported. How far it’s travelled, and how it was produced will influence the price. Don’t expect to be sitting down to a juicy steak for less than SG$50. The good news is that you can get a decent local meal at most hawker centres for under SG$7. Unlike most of Asia, Singapore’s water is drinkable straight from the tap and food hygiene standards are excellent. The National Environment Agency tightly regulates the industry and gives each food premise a grade based on its hygiene which they must display in a prominent place. You can read more here. Kaya Toast is a product of British colonial influence and Asian migration. Historically, the large majority of Chinese immigrants to the Malay Peninsula were from the Hainan Province. Many of these migrants found work as kitchen hands on British ships and learnt to cater for traditional European tastes with the substitution of local ingredients. It is believed that this is the origin of kaya toast. Like all good meals, Kaya Toast is all about balance. Molten butter and kaya (coconut jam) are smothered on dry, crunchy toast and served with soft cooked eggs. A few drops of thick, dark, salty soy sauce counters the saccharine kaya. 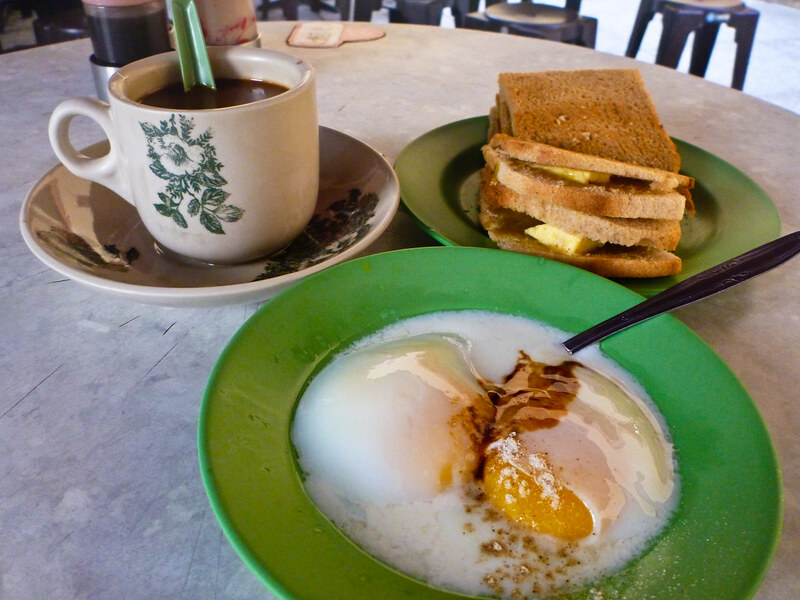 Kaya Toast is available in most hawker centres and kopitiams (local coffee shops) and there is a chain dedicated entirely to the meal – Ya Kun Kaya Toast. The first time I tried Popiah, it was described to me as the “Asian burrito.” In fact, Popiah is a spring roll made with a thin, crepe-like wrapper stuffed with cooked meat and vegetables, then eaten fresh – not deep fried. The Popiah made its way from China down through southeast Asia with the movement of traders. Unique spin-offs were created with local ingredients in places such as Philippines, Malaysia and Indonesia. The Popiah wrapper is made with wheat flour, water and a pinch of salt. It is spread with sweet sauce and chilli paste, that is sprinkled with flecks of fried garlic. A lettuce leaf is layered next to prevent the wrapper getting too soggy. The most common cooked fillings in Singapore are bamboo shoots with shrimp, sautéed garlic and pork that has been cooked in broth. That is topped with some combination of fresh ingredients such as: beansprouts, omelette, cucumber, coriander, Chinese sausage and shrimp. The Popiah is rolled and sliced into bite-size portions to be eaten with your fingers as a delicious snack or accompaniment to a meal. 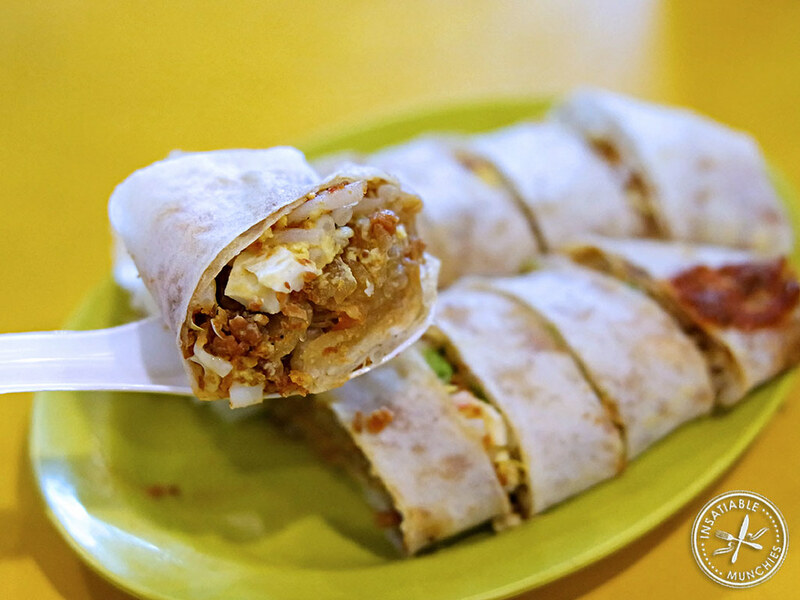 You can find Popiah in most hawker centres in Singapore, and Open Rice will direct you to some of the best. Alternatively, try making them at home with this recipe. 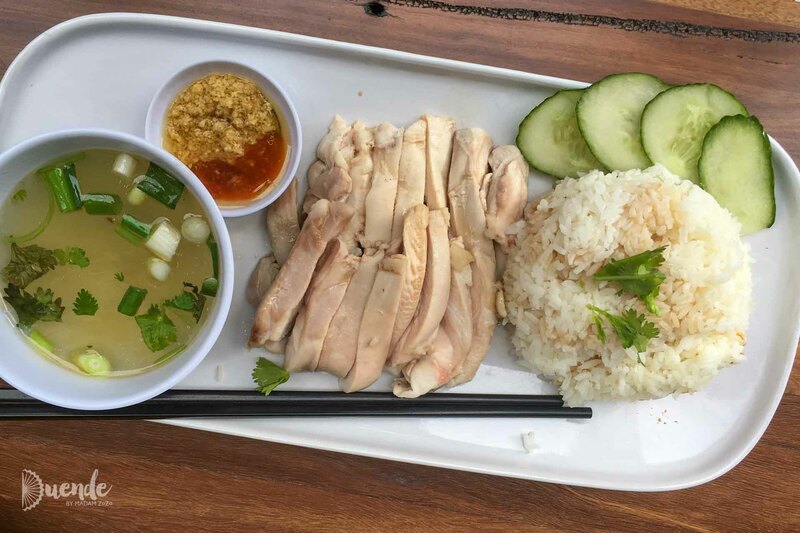 Chicken Rice is Singapore’s national dish and on first appearance seems simple enough. However, looks can be deceiving – on sampling your first bites, your taste buds will detect that this is not just poached chicken served on steamed rice. Much of Singapore’s Chinese population are immigrants or descendants of immigrants from Hainan, a tropical island and most southern point of China. The diaspora brought with them a dish called “Wenchang chicken” that formed the foundation of the Singaporean version. Combined with the influence of Cantonese immigrants who used young, tender birds and brought a chilli-garlic dipping sauce to the mix, Singaporean’s developed their own unique style of chicken rice. The secret of what we now know as Singaporean or Hainanese Chicken Rice is the rice preparation. The grains are first fried in chicken fat and then cooked in broth for a subtly delicious flavour that reinforces that of the chicken. The tender chicken is usually offered poached or fried (white or brown) and sliced into bite-size portions with a side of chilli-garlic dip. Most hawker centre renditions will present the dish with a garnish of cucumber slices and served as a “set,” meaning it will come with a little bowl of broth on the side. If like me you prefer some greenery with your meal, order a side of vegetables which will typically come doused in a mysteriously delicious combination of sauces, topped by a sprinkling of fried shallots. 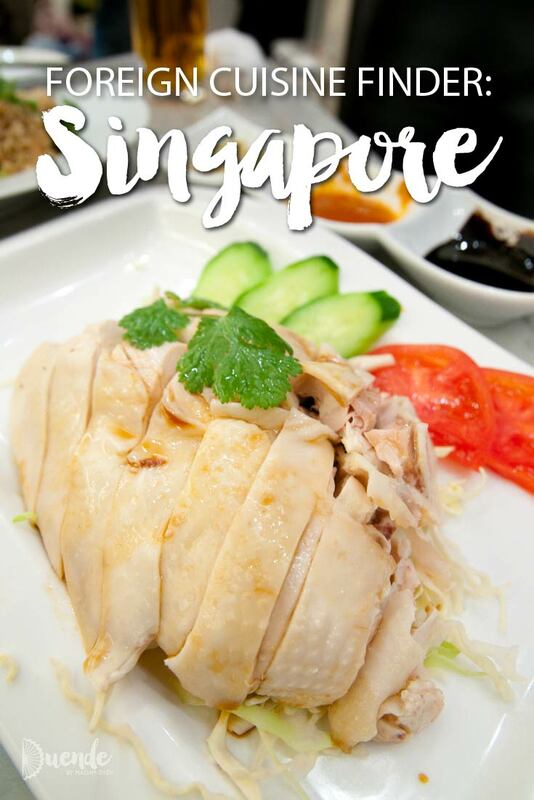 The best Chicken Rice in Singapore has long been said to be at Tian Tian Hainanese Chicken Rice. I never ate there because the queue is notoriously long – about 45min to 1hr wait. There’s plenty of good Chicken Rice in Singapore, check out some of Tian Tian’s closest competitors here. For a giggle, check out Tiger Beer’s alternative history of Chicken Rice. Enjoy tucking into some great Singaporean food and don’t miss my other secrets of Singapore, plus top things to see and do during your visit. Very comprehensive and informative, Zoe.